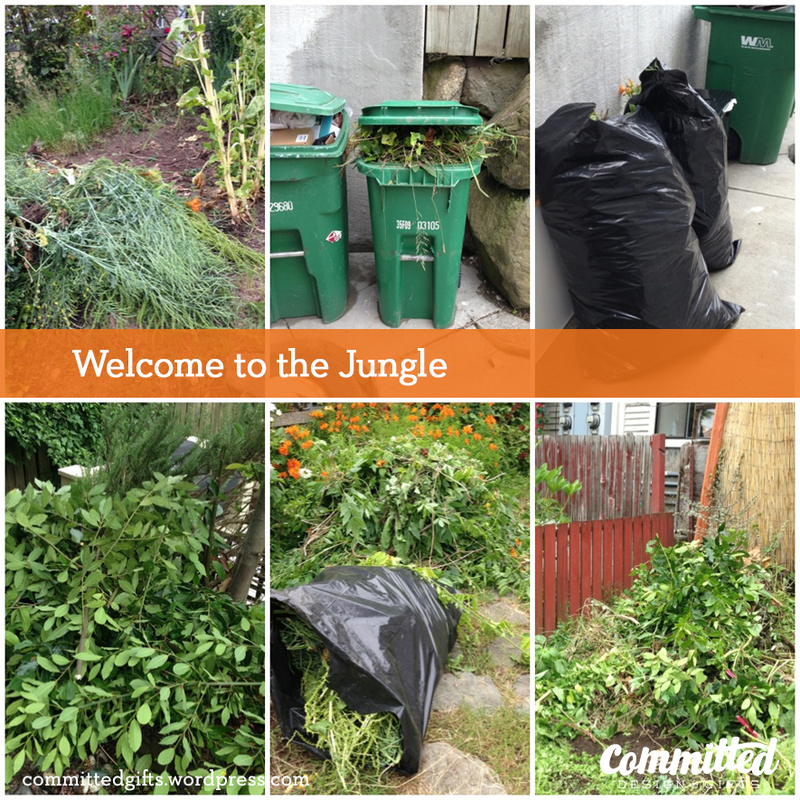 Makeover Monday: Taming a Jungle | Committed. Next we tried hiring gardeners to come out and pull, trim, and tame everything back. A hefty sum of money (ahem, equivalent to RENT), and six weeks later, it was all back with a vengeance. My next plan was to hire a garden consultant from Seattle Tilth to help me create a plan to make it more sustainable. And by sustainable, I mean, not spending 30 hours per week maintaining some level control over the growth. So what she proposed was flame weeding the stone paths, and then this method for taming the rest. Decide what area bugs you the most. It may not be the most visible to the neighborhood, but if it bugs you, you’re motivated to tackle it. Work on a small area at a time (approx 3′ x 2′). This sounds like so little, but with the invasive weeds, it really was about the amount of work I’d want to do in one go. Again, just stick with that area until it is FINISHED. Don’t pull weeds over your entire yard, then go back and prep for planting. You’ll NEVER stay on top of it. Trust me. Add some nutrients to the soil (compost, organic booster, whatever your soil needs to give some love to plants). Plant your desired plants, trim back the ones you want to keep. Cover ALL dirt (up to the stems/trunks) with cardboard. Yes, cardboard. This is an amazing weed blocker! It’s water permeable and it decomposes after a couple of years so you can re-till and re-compost after a few seasons. Not after a few weeks. Oh, and it’s free. Just hang on to shipping boxes or raid a dumpster behind your local supermarket. If there’s tape on it, don’t sweat it. When you dig in next time, you can pull it out. Cover with several inches of mulch or compost. A good guide is to use the thickness of the compost bag, which is about 3″. I used Cedar Grove compost, which closes the loop in Seattle yard waste collection, and is occasionally offered at 3-for-2. Install your drip line, water regularly. Watch your PLANTS, not your WEEDS grow! Move to the small next area. So I took her advice. This was last fall. 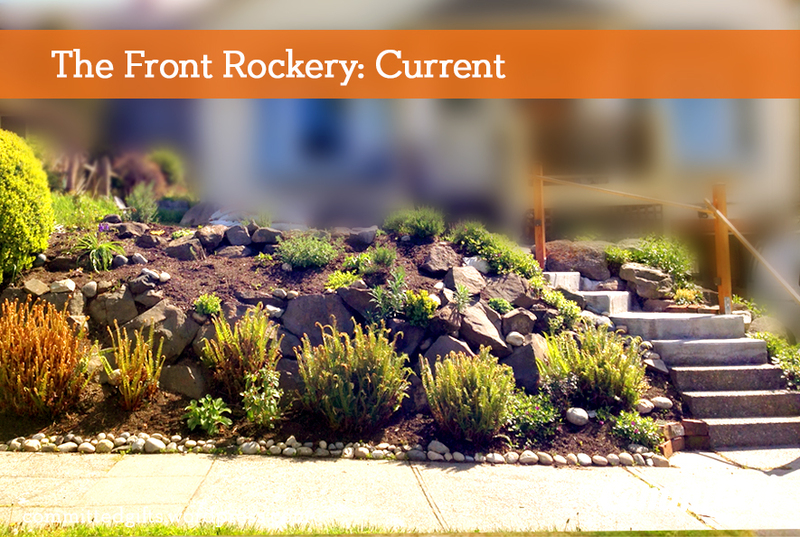 What bugged me most was the rockery flanking our driveway and along the sidewalk. It was a mess, but had great potential. I did a lot of Pinterest searching and took some of the consultant’s advice to stick in varieties of thyme (edible, great ground cover, spreads well, and keeps a low profile). It took about 2 weeks of a few hours every few days, but it was done! 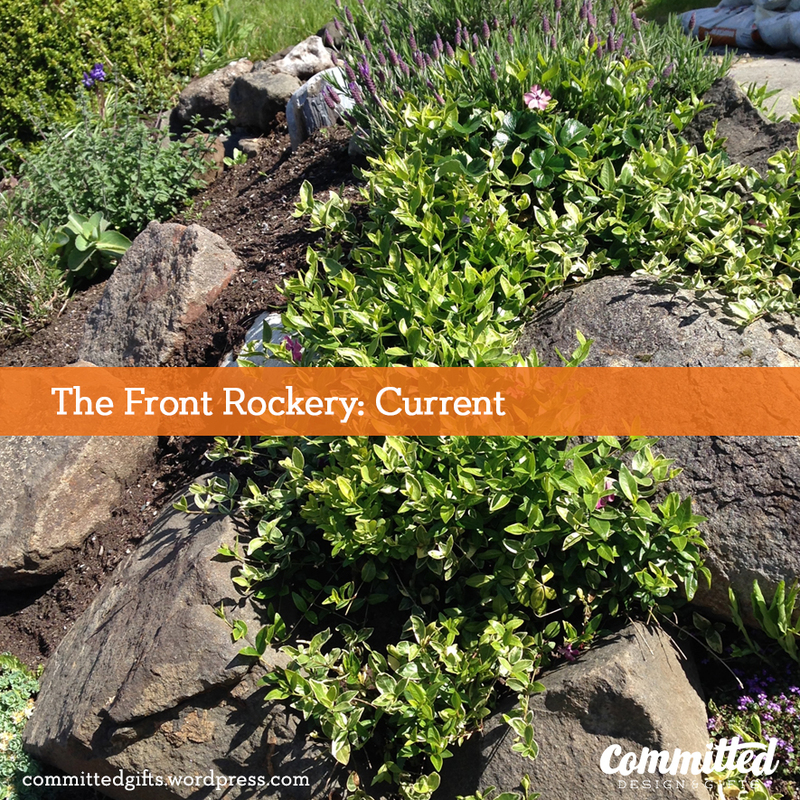 Rockery? 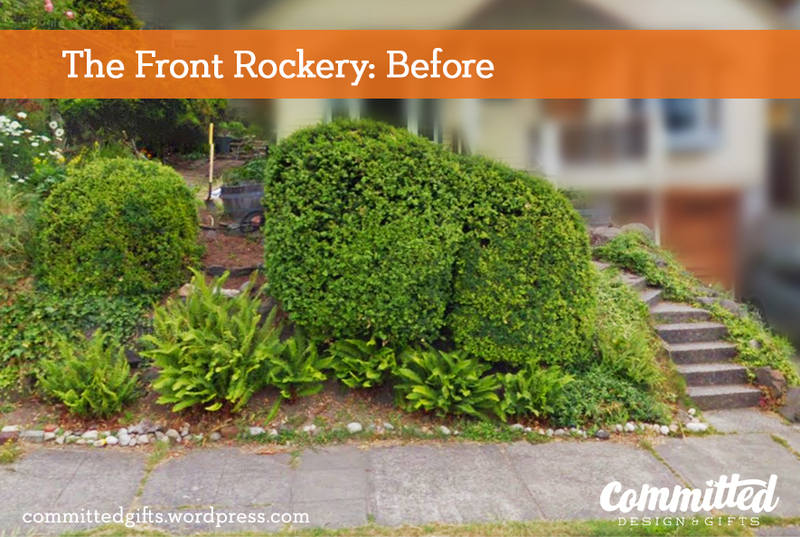 What rockery? The boxwoods hid the weeds. This photo is from before our move-in. Cardboard + compost mulch works! Plants are now cascading between boulders. Thyme and succulents are blooming too! Encouraged by these results, and the beautiful weather we’re getting this week, I decided to tackle another area. We have a small plot in front of the front window (above street level, but visible when you come up the front steps) that’s dying for a makeover. It was completely overgrown by alstroemeria, which are beautiful, but grow rampantly and choke out everything else. We pulled them all, and they all grew back. So. 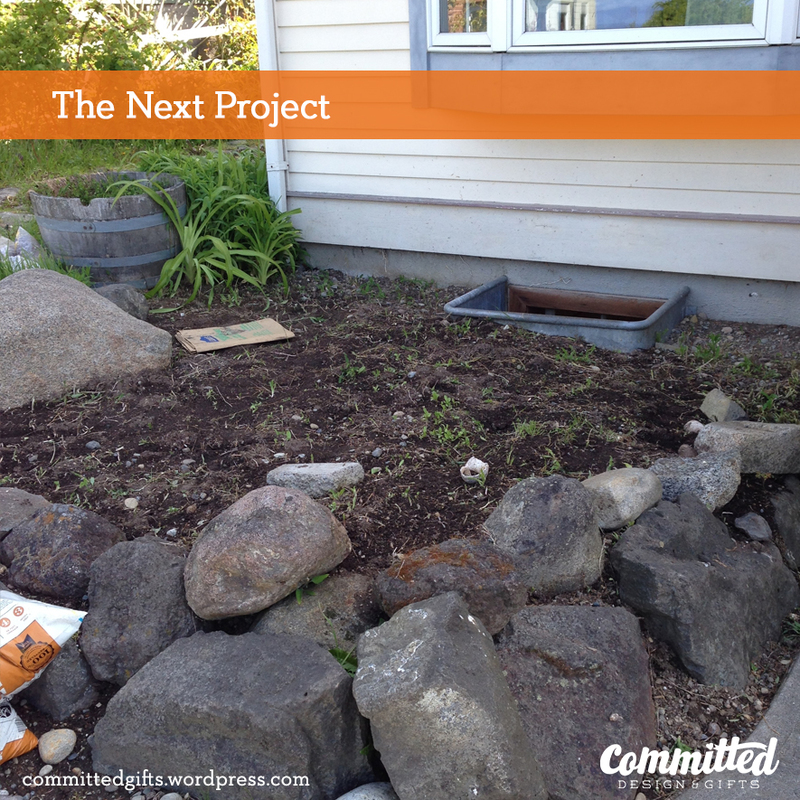 This week, I’m digging this up, planting new stuff, and doing the mulch thing again, hoping for the best! 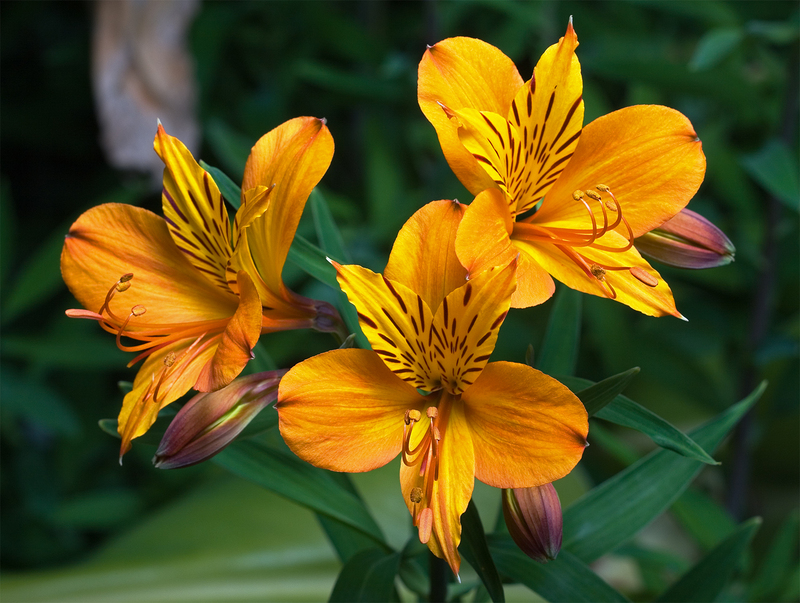 Alstroemeria: beautiful, but hard to control. I broke the rules and pulled the whole area, but WILL tackle this baby this week! What spring project are you starting this week? Oh I love being able to see all the rockery and the way the plants meander through the rocks! Me too! It takes a little more maintenance, but looks so pretty! Thanks for stopping by! Hmmm…it is winter here now so our garden is wet and green. I wonder if it’s a good idea to fertilize it and cover it with cardboard and wait until spring? The cardboard is likely to turn into a soggy mess though. Is that OK? Hm. It’s okay for it to turn soggy once you’ve planted and covered with mulch–that’s the idea. I’d say for wintering, maybe something a little more substantial to protect the soil. I did use burlap for our last garden–treated the soil, then covered with burlap for a few months until I was ready to plant. When I pulled it up, the soil was fine and there were only a few small weeds poking through, so I’d recommend trying that until you’re ready to plant! Then go to town with the cardboard and mulch. Thanks for stopping by my blog!